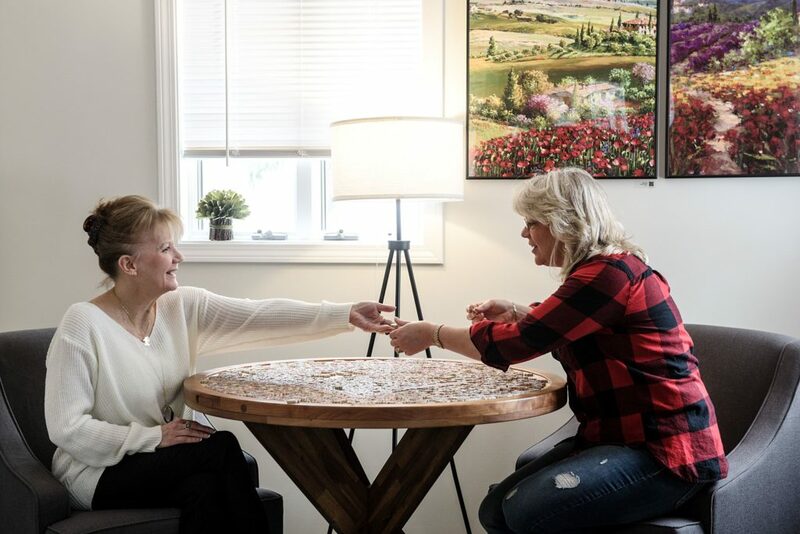 Jennifer Lennox, right, and Paula Tardie, left, have both worked for Stave Puzzles for 30 years and they bought the high-end jigsaw puzzle manufacturer from founder Steve Richardson in 2016. When sitting for a portrait at the company's Wilder, Vt., headquarters, the business partners turned their attention to a 1,000 piece puzzle laid out for visitors on Tuesday, Jan. 15, 2019. (Valley News - James M. Patterson) Copyright Valley News. May not be reprinted or used online without permission. Send requests to permission@vnews.com. 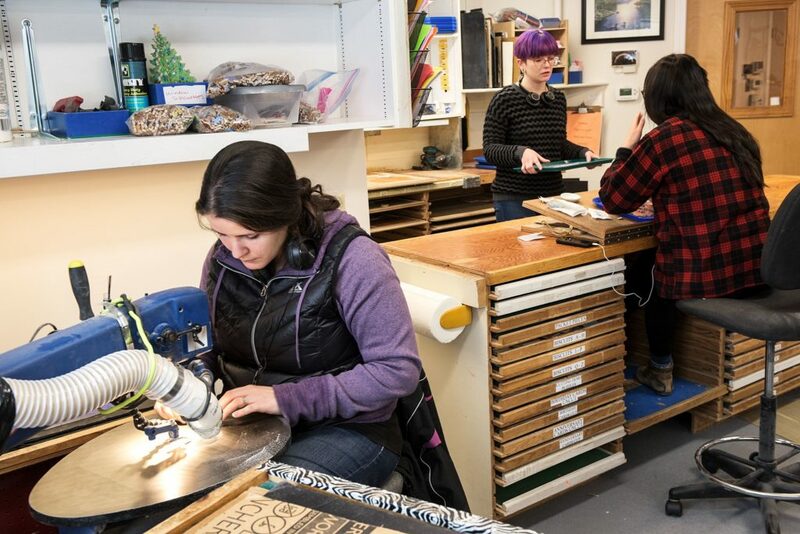 Christina Julian cuts a puzzle at left as apprentice employees Marisa Chapin, middle, and Kat Chau, right, work in the finishing area at Stave Puzzles, where pieces are touched up and the backs of the puzzles are sanded, polyurethaned and buffed in Wilder, Vt., Tuesday, Jan. 15, 2019. Apprentices work for six months to a year to learn the craft before their work can be sold. (Valley News - James M. Patterson) Copyright Valley News. May not be reprinted or used online without permission. Send requests to permission@vnews.com. Lisa Josler prepares a puzzle to be shipped in the Stave Puzzles time-share program at the company's Wilder, Vt. workshop Tuesday, Jan. 15, 2019. Time-share customers have six to eight weeks to complete each one of six puzzles and at after finishing them all they get to keep one of their favorite puzzles of the series. (Valley News - James M. Patterson) Copyright Valley News. May not be reprinted or used online without permission. Send requests to permission@vnews.com. It was 1970, and Steve Richardson was out of a job. 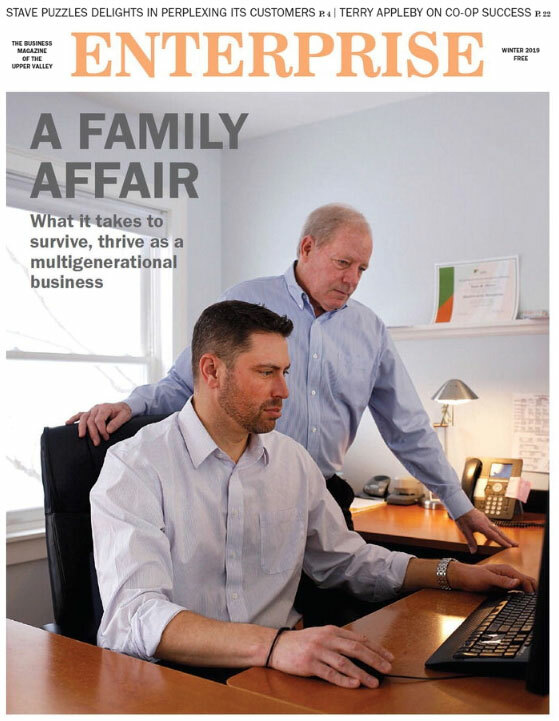 He’d moved his wife, Martha, and their two young sons to the Upper Valley from New Jersey to work in a software development firm, but the company went broke and everyone was laid off. It’s not too much of a stretch to say that his professional life was in pieces. Richardson started a software business, got bored and sold his share. He bumped around Hanover a bit and started a second business in 1974 with partner David Tibbetts, making puzzles for high-end Boston department stores. Their marketing strategy? “We advertised in the Yellow Pages,” he said. And that’s when things went to pieces altogether. “I got a call from a well-heeled Bostonian,” he said. 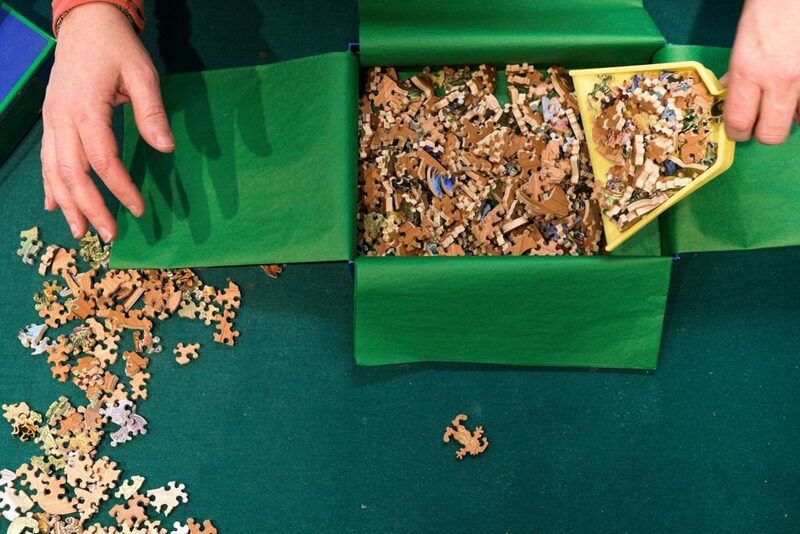 “He desperately needed a special puzzle for his wife, and the company he’d been buying them from — $300 for 500-piece puzzles — was out of business. I realized there was an extremely lucrative, untapped market out there, a clientele of wealthy eccentrics willing to pay outrageous amounts of money for puzzles.” That was the moment, Richardson said, when Stave Puzzles was born. Maddening, ingenious and beautifully handcrafted in cherry wood, Stave’s creations are sought after by the likes of Bill and Melinda Gates. Former first lady Barbara Bush, who died in April, was a fan, as was the whole Bush family. It’s one of the Upper Valley’s most iconic business success stories, and, like certain other American business triumphs, it started in a garage. The first Stave puzzles were made behind Richardson’s house on Main Street in Norwich. After their success with the Yellow Pages, Richardson and Tibbetts hit on the idea of taking out an ad in the New Yorker. It’s safe to say that Richardson, and the persona he’s assumed as Stave’s “tormenter-in-chief,” has been the driving force behind the company’s success, but Stave also cultivates a kind of rarefied intellectual elite in its puzzle solvers. Driven to distraction by the “tricks” in each puzzle — many of them custom made to recognize a birthday, anniversary, beloved pet or favorite vacation spot — Stave customers keep coming back for more and fueling the company’s creativity with their ideas and requests. Today, from its headquarters in Wilder, Stave creates some 1,500 puzzles a year. There are stock items starting in the mid $200s and custom numbers that take weeks to create and can cost upward of $20,000. A visitor to the light-filled building on Olcott Drive will find a genial, close-knit group of 25 employees divided between marketing and production, words that don’t quite adequately describe the quirky process that eventually results in one-of-a-kind masterpieces prized the world over. Paula Tardie, who now runs the company with colleague Jennifer Lennox, was one of Richardson’s first administrative employees. Steve and Martha Richardson, she added, have offices in the building and provide constant input. Like Richardson, Tardie seems to derive a perverse delight in showing off some of the most difficult Stave creations, while the whine of scroll saws echo through every corner of the building. She refers to a jar of silhouettes — special puzzle pieces that Stave creates for each customer. One is shaped like a seashell, another a perching bird. Others are sailboats, waves, a four-leaf clover and customers’ names. Stave is always coming up with new “tricks,” thus ensuring that its customers come back for more misery. To make matters worse, Stave puzzles can be three-dimensional. Many don’t have the edges in which jigsaw puzzle solvers traditionally find refuge. Or there are fake edges combined with elaborate cut-outs that could be almost anywhere in the image. Trick pieces can take the shape of a rebus (in which each part of the rebus is made up of ridiculously difficult interlocking pieces), or they can be an anniversary date, a puzzle within a puzzle, or a piece of a story. And then there are the “teasers.” On a difficulty scale of “one to four swords,” teasers start out like normal puzzles. Some even have edges. But that’s where expectations end and frustration begins, with images within the edges that interlock in spectacularly difficult ways, or empty spaces that determine which piece fits where and in what configuration. Sometimes they include pieces that are visual puns, like a splash of color in the shape of a tiny paintbrush. Others, like Stave’s popular rendering of “Champ,” Vermont’s eponymous lake monster, is made up of only 44 pieces that can be put together in more than 32 different ways — only one of which is correct. For those accustomed to using a puzzle box’s cover as a guide, Stave provides no help at all. These puzzles come in a plain blue box emblazoned with Stave’s signature “trickster” puzzle shape. You’re on your own with these creations, which is just the way Stave likes it. Stave puzzles are treasured collector’s items, passed down from generation to generation within families. Tardie, Lennox and Richardson acknowledge that they cater to an elite customer base, and that the rich and famous throughout the world come to Stave when they want to give a gift that can’t be found anywhere else. But they also have an innovative “timeshare” program that loans out up to six puzzles for six weeks at a time. Finished puzzles are returned to Stave and then circulated to the next person in the timeshare. At the end of the program, each solver gets to keep one puzzle at a fraction of the price it would cost to purchase. Of course, the timeshare program requires that a puzzle be completed in six weeks — its own special kind of torture. One of Stave’s most striking aspects is the gender makeup of its staff. With the exception of the founder and one staff member, all Stave employees are women. Current owners Tardie and Lennox theorize that designing and cutting Stave puzzles is like quilting or other highly detail-oriented crafts typically associated with women. As if on cue, Geoff Cota, the lone man in the Wilder headquarters, chimes in. “I’m just one of the girls, and I wear it as a badge of honor,” he said. Cota customizes and enhances images before they get to the cutters to include irregular outlines or other features that make them nearly impossible to put together. One of his works, The Mane Event, is Stave’s first “five-sword Teaser,” a category of difficulty reserved for only the most foolish, or those with X-ray, three-dimensional vision. Tardie speculates that men are more drawn to the woodworking aspect of the business but don’t stay long because it requires such extreme attention to detail and fine handwork. “Maybe they just can’t cut it,” she added, with a hint of sarcasm. Tardie, Lennox and Richardson all agree that the Upper Valley has played a significant role in Stave’s success and longevity. “And our customers are compelled to bring order to the chaos we inflict upon them. But we do have our limits,” he admitted, recalling a visit to Stave headquarters by the Gateses.